Walk out the front door and step right off the deck onto the beach. Watch the sunset each night sitting right on your private deck and enjoy your first cup of coffee each morning watching the sun come up from your own private porch directly on the beach. We can offer you our three bedroom two bath home. The master bedroom has a king bed with a private bath. The other two rooms each have twin beds and TV'S With VCR'S.The second bath room is in the hall. Fully equipped kitchen. We are located between Rosemary Beach and Carillon Beach on your own private stretch of the beach. This is the perfect house for a small family or for couples needing just to get away. Relax in your own private paradise as you listen to the waves each night. Or just unwind riding bikes on the bike trail right down the road. Beautifully decorated home that is two minutes from highway 98; five minutes from the Winn Dixie and twenty minutes from Sandestin shopping. We are thrilled to share our special home with you. The Comer's have been in this area for a long time. Toasting the sunset. Enjoying the most amazing views you will ever find. Great location-right on the beach! Staying at the Comer Beach House was both energizing and relaxing. The beach house was easy to find. It was exactly as was posted on Home Away. Donna's attention to cleanliness and details are most appreciated. We had comfortable beds, great linens, everything needed to cook/bake in the kitchen, tv, wifi, and a washer/dryer that came in handy. Having both a covered porch and an open deck provided us with being outside in the best of weather and inside yet still being ocean front when the weather was a bit chilly. My only regret is that we did not book this place for 2 weeks. What a wonderful place to be with family! Karen thank you so much for staying at the Beach house. I am very thankful for wonderful guests like you and your family. We just finished our 9th year at Comer Beach House. The owner is wonderful to work with. 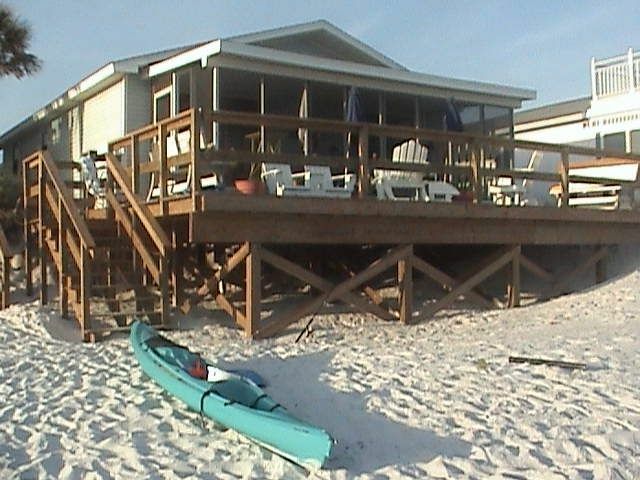 The house is perfect for us and sits right on the beach. Everything is provided to make this the perfect beach location. The reason this rating is low is because we were forced out by Hurricane Michael within 2 days. Loved the house, which is as close to the beach as you can get. It was spacious for our family of four and charmingly decorated. The outdoor/indoor decks are a wonderful feature. Although our stay was cut short by a hurricane, we would definitely rebook. The owner also was in frequent touch before the storm and gave us excellent guidance about what to do. If not for the storm, I think we would have had a lovely, relaxing getaway here. I am very sorry that Hurricane Michael affected your stay but we did refund all of your monies we collected and we were very thankful you were okay. We stayed here for the first time this summer. The location was perfect with amazing views and a very well maintain home. We will be back to stay at this gem of a property that is perfect for families. We've been coming here for several years and have loved it every time! The owners are accommodating and very approachable! We hopefully will be able to return again next year if our schedule allows!